We continue our special birthday interviews: the next stop is Canada and Rosanna Crawford. BFH: Rosanna, first we would like to wish a very happy birthday to you from Hungary!!! I think you can be satisfied, because you had a great season, fantastic results mainly from December! How would you summarize your season? Rosanna: Last year was my best season on the World Cup ever. It started off really well in December. After coming home for Christmas I had a bit of bursitis in my shoulder which made me take some time off. By the end of World Champs I feel I was almost back at the same ski speed at December but unfortunately right after WCHs I got sick for 9 days and had a really hard time coming back for the last World Cups. BFH: According to the last year results (you were the best Canadian in the overall WC ranking) we can say you are the leader of the team together with Zina. What are the goals for the next season and for Sochi – for you and for the team? Rosanna: As a team we are growing and one of our main goals is to achieve a top 8 in relays. I believe with some better shooting our team is capable of it. My personal goal is to have a more consistent season. Being in the top 30 all year and of course being at my very best in February 2014! BFH: What is your training plan for the summer? Where are you and what are you doing now? Rosanna: For the summer we will spend most of it training in the Rocky Mountains in Canmore. We have a great roller ski loop and range here and there are a lot of strong athletes who train out of Canmore. We will do some training camps in the States, as well as some workouts with the Canadian cross country team. BFH: We talked with Scott Gow about the popularity of biathlon in Canada – do you think a medal from Sochi would be enough to raise the interest of the Caandian people significantly? 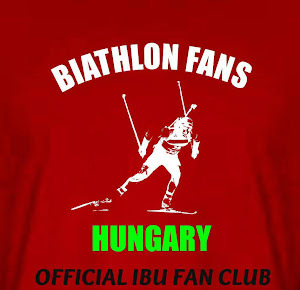 Rosanna: In 1992 and 1994 when Myriam Bedard won her gold and bronze medals, that got Biathlon known in Canada. I believe that a medal could for raise some more interest in Biathlon in Canada, but we also need to get it being shown on TV here in non Olympics years. It is such an exciting sport to watch and I really think that if Canadians were exposed to the sport that it would gain popularity in Canada. I mean we are supposed to be a winter nation and not just hockey! BFH: We, the Hungarian fans are great supporters of the Canadian team – and we have a French friend, David, who is maybe even a bigger Rosanna fan. (He got your bib after the individual.) Do you have good memories from us or have some special message to our group or to David? Rosanna: Thank you for your interest in me and I will try to do you proud next winter! Thank you for your answers and we wish you good work for the summer trainings!